Successfully Added Car Reversing Set - Sensors + Rearview Camera + Rearview Screen to your Shopping Cart. 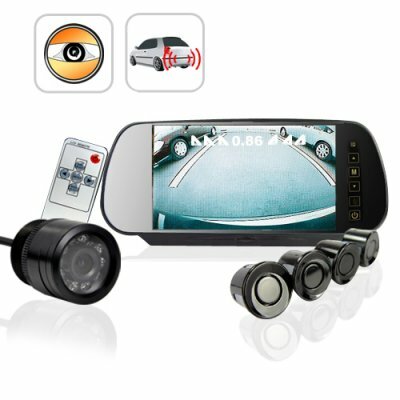 All in one car reversing set with everything you will need for safety as you back up your car, including a touch button 7 Inch car rearview screen monitor, 4 radar sensors, a weatherproof rear view IR equipped night vision camera, and a handy senor box to connect everything together. Some excellent features include voice warnings of distance from the included speaker, detection of up to 2 meters which will be displayed on the rear view monitor LCD in incremental centimeters, and auto powering and viewing of both the sensor and the camera when the car goes in reverse. In stock now for single piece or bulk orders, order yours today! on 2011-08-26 02:45:47 CVEZJ-700HH It is possible to see with the daylight. It is possible to see with the daylight. I bought one for my wife's new car, the instalation was very easy, the camera quality is very good. I have ordered another 4 since then. on 2011-01-08 22:50:07 this product is this best think that could ever be invented. I think it will be a good gadget on the market. it also would be even better for older people that might problem looking back when backing up. i can't wait to have my own. Ordinato il 19 novembre notte, alle ore 10.00 del 23 novembre già a casa (Sicilia).